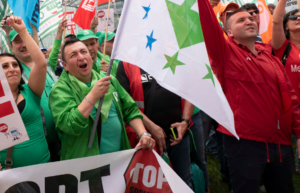 The ETF is a federation of unions and their members all over Europe, but our day-to-day work is coordinated by a small and dedicated team based in Brussels, Belgium. As members of local trade unions, these staff will be joining the national strike called by all three major confederations in Belgium for 13 February 2019. Trade unions have called the strike because the government refuses to permit reasonable pay increases, despite years of restrained wage growth. Workers are also demanding fair pensions and social benefits that guarantee a secure level of income. Finally, the strike will call for easier access to public transport subsidies and labour market reforms to create a better work-life balance. The ETF office will be closed and our staff will be less responsive than usual (except those already scheduled to be working outside of Belgium that day). However, we will be joining picket lines across Brussels, and you will see our staff in action on ETF social media. ETF General Secretary Eduardo Chagas sent a letter of support and solidarity to ETF’s Belgian affiliates and the three confederations. This letter was sent by ETF General Secretary Eduardo Chagas to all our Belgian affiliates and the three national union confederations, expressing our support for the national strike of 13 February 2019.